LISTEN NOW! As Greg and Pat discuss whether Secretary of State John Kerry, is throwing Israel under the bus as he encourages lawmakers to refrain from imposing new sanctions on Iran. CBN News reports that, “In an agreement reached last month, Iran agreed to stop enriching Uranium over the next six months; but, it was in exchange for the U.S. not to impose new sanctions during that period.” They continue to discuss that it’s not wrong to do what your told however it does matter who is the one telling you what to do? They continue to reiterate the importance of praying for our leaders. We have leaders who have different viewpoints of America. They were seeking a transformational presidency that would bring fundamental change. There is large number of people that are behind this. 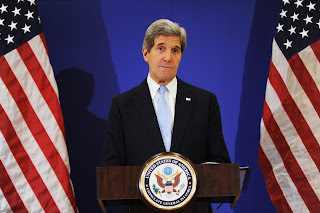 Secretary John Kerry is saying, do no put new sanctions on Iran almost as if he is buying time, 6 months specifically ends up right around the four blood moons. We are seeing a battle for Jerusalem unfold; they are using Alinsky tactics and Secretary of State Kerry is okay leading it all the while Israel becomes a sitting duck. Is Israel being thrown under the bus.? It’s time for the church to rise up and not get caught up in the horizontal and understand the need to stand for God and Israel. They encourage us to focus on knowing the Lord and he will take care of us.